Heroes: Gone . . . Thin ice spreads a broad surface steady cold winds skate across. 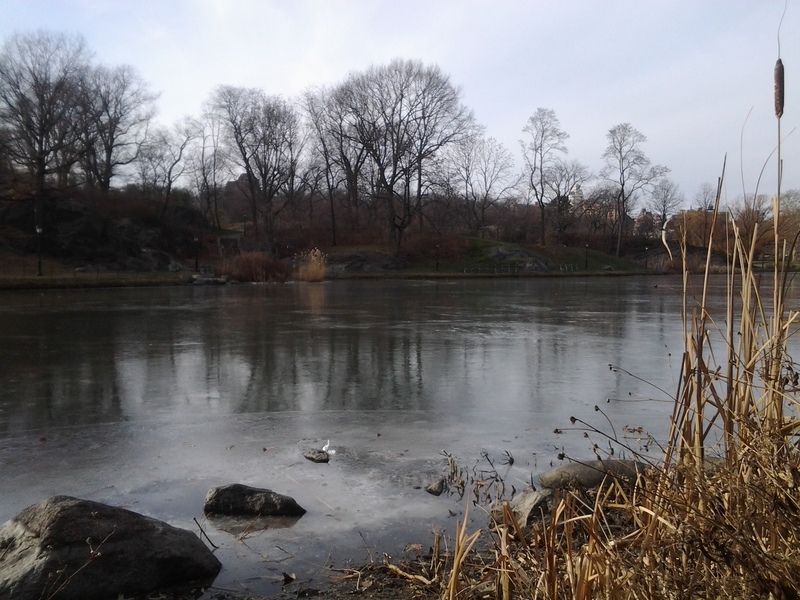 Positioned beside a stand of dry cattail, exposed face feels a slap along the banks of the Harlem Meer, here one calendar month into Winter. “David Bowie has died.” became an actual phrase as tough to bear. The headline’s words smacked me awake last Monday morning. Temperate December gone as a switch flicked on to a frigid January. What a way to begin. Then a man known to a young outdoorsman as “Grizzly Adams” portrayed by the now late Dan Haggerty, passed away. Reading regenerates. Any flagging level of retention or enthusiasm for the written word must be engaged since for the writer the word can at times be work. 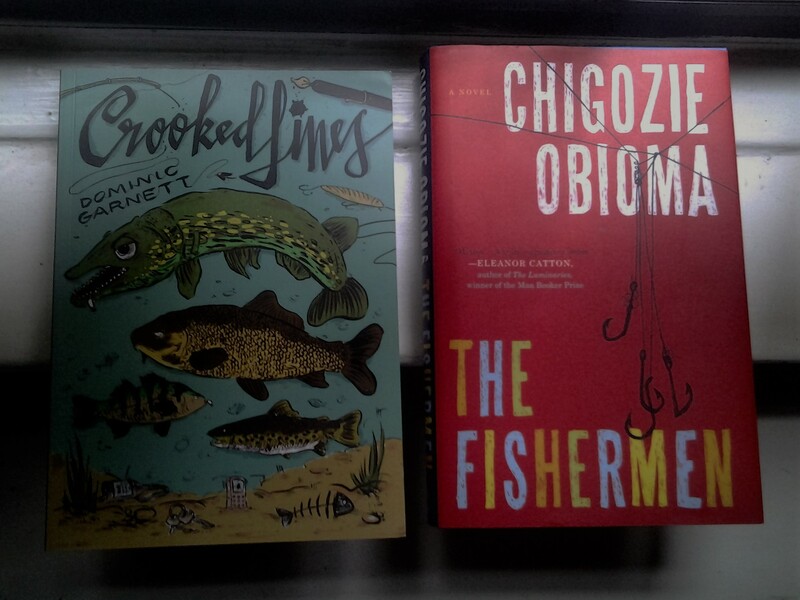 Reading for professional growth becomes pleasure when the titles are as strong as Crooked Lines by Dominic Garnett and The Fishermen by Chigozie Obioma. Fishing is a subject rendered in broad terms on these pages. Story, profound and fun, can be found in every line. The light of Winter: brilliance filtered clear scenes of brown, white, and blue finished by a tangerine sunset. That light gives hope, braced by added good timing in the form of a gift of new shoes, Saucony cross trainers, paired with an Ebisu tenkara rod that received express professional service from the Repairs Department of Tenkara USA. Support of this speed and quality has allowed me to grieve by living life as fully as I can squeeze It into a day. Loss can be reabsorbed and channeled into positive productivity and even happiness when pushing into a period of life experienced at a higher notch. David Bowie lived such a life. He pursued multiple art forms to high levels. He could dance. The theater and film embraced his performance. And he painted. David Bowie, artist, left us a large body of painting and sculpture. My appraisal sees his his work fit the historical space adjacent to Francis Bacon when it comes to rendering human personality and psyche through expressionist treatment of the portrait face. 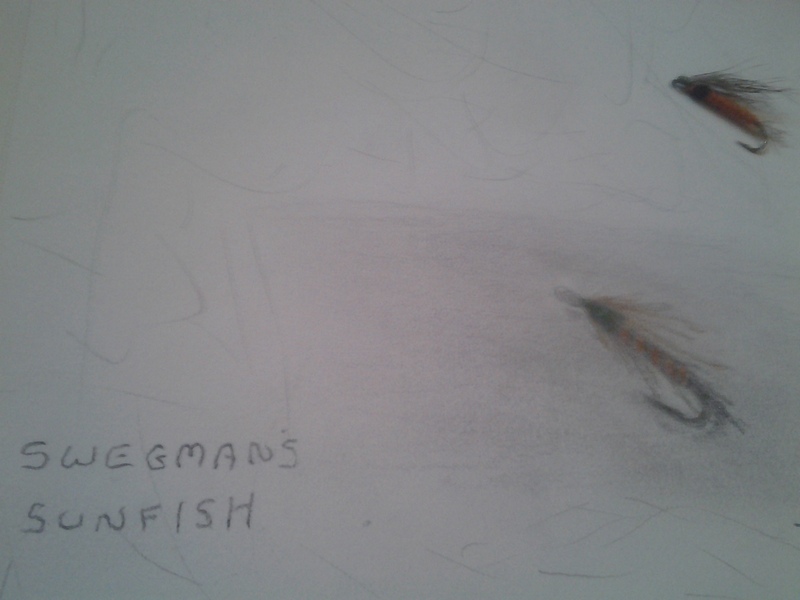 Fly tying and illustration fit right in step with this multimodal creative expression. Combined with writing, these arts and crafts can also bring a fishing book to term. Writing, like most all the creative channels, involves the malleable process of the Plastic Arts. The setting of eleven on my own amplifier can be activated by the blending of art and sport. Running combined with some safe clambering over rocks, safe climbing of trees, legal catch and release fishing. Bird watching, cycling, and yoga can be included as well. After the stretch and a cool down, the documentation through multiple art forms may happen, sometimes. The cycle of (my) Life, work I deem ample enough for a human life span. David Bowie gave insights into this way of living one’s life. Dan Haggerty breathed life into a character who carried such convictions into the outdoors. Activity and Art: a lasting living legacy, a positive path pointed out so well by two heroes: the sensitive animal man, last name Adams; the putative human, first name David. 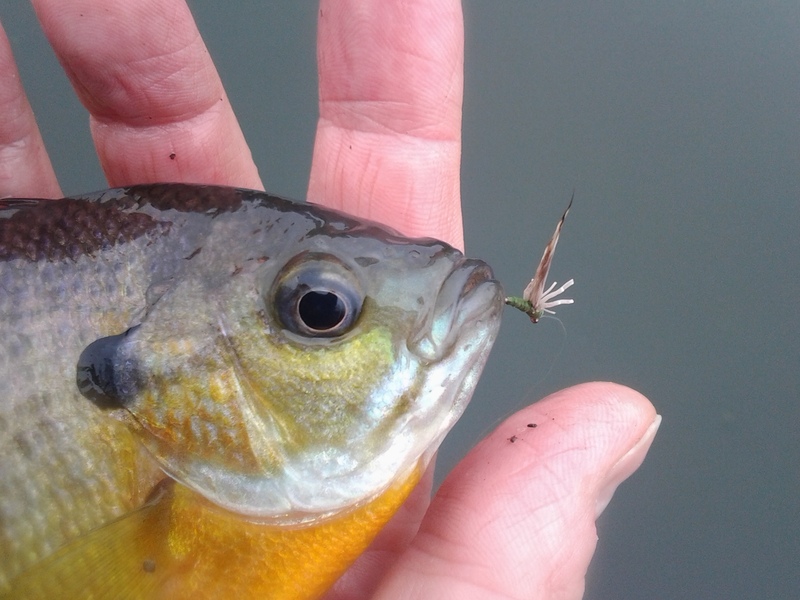 Swegman’s Sunfish Catches A Fish . 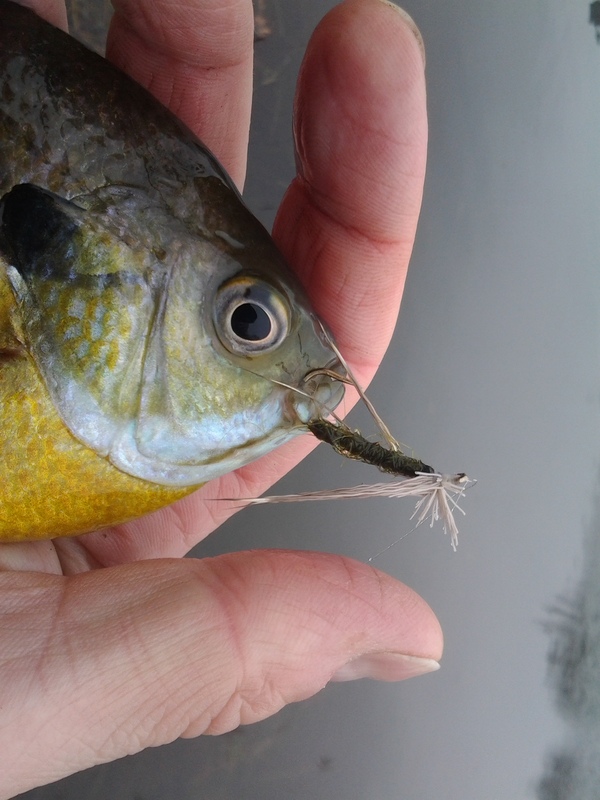 . .
Swegman’s Sunfish lured Lepomis with orange breasts to match the twitch, hooked, and tethered to a hook holding hair rather than feather. Green guaranteed even as the NYC region remains brown. 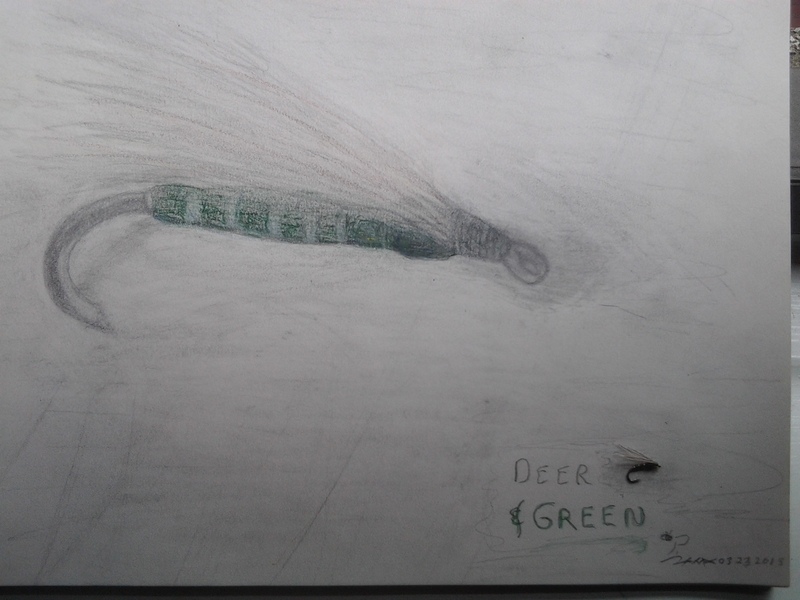 Tenkara Art: Deer and Green . . . 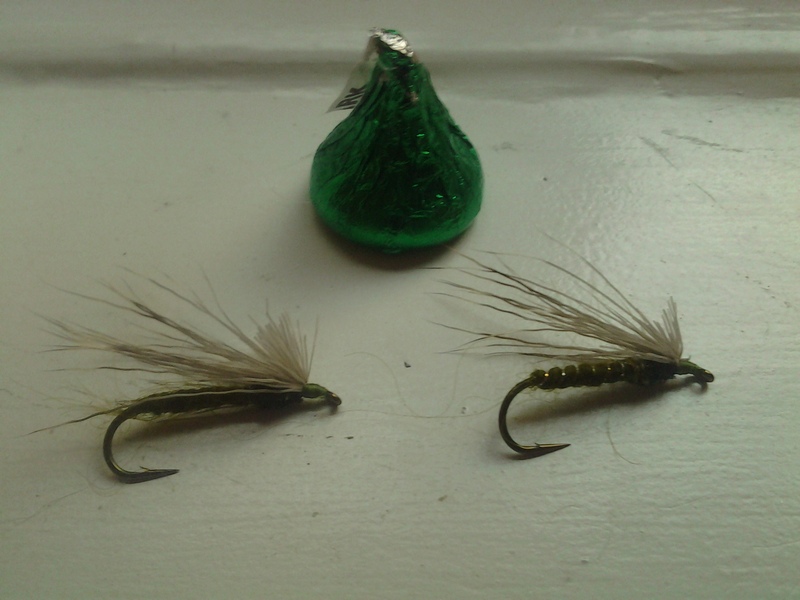 The Deer Hair and Green is a soft hackle kebari tied with an American or Western oriented hackle. The recipe includes four-strand floss, French tinsel, and deer hair. Eastern brook trout are attracted to this pattern in size 14 through 18. A large portrait of a small kebari lends an illustrative slant with a faded, marbled, impressionistic effect, the way the eyes perceive the soft blur of a pattern set in clear stream water. Colored and other pencils on acid-free paper in natural light remain my medium and process. On Parade . . .
Color conveys the general feel of this fly pattern. Warm in a rustic and pastoral way. Of course, fishes. 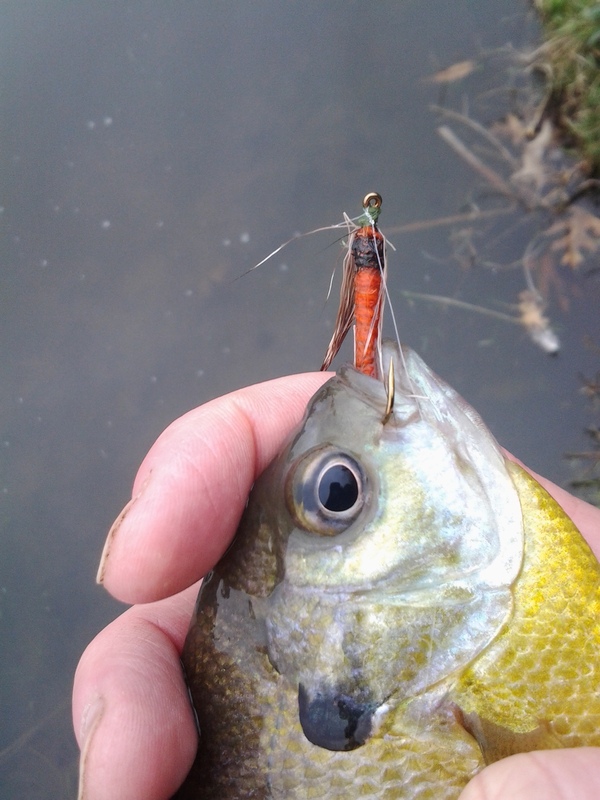 The small shiner or chub minnow here meets adequate imitation. Unweighted, this one serves well under the controlled twitch of a tenkara rod along seams of current following fast water. Weighted, this pattern oriented forward can dart along submerged walls of stone or weed. Most of the freshwater fishes find such presentations interesting. 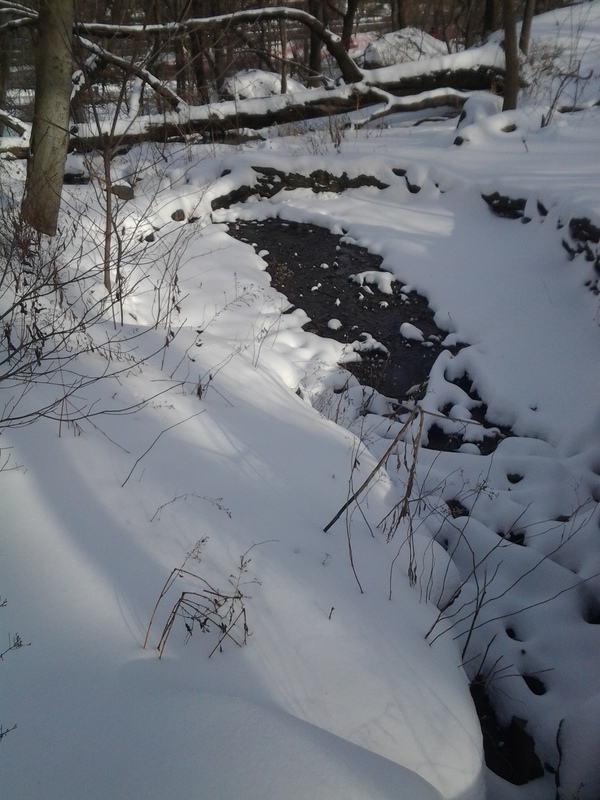 There is a quiet brook in New York City where songbirds sip on the clear day after a storm. Sky spreads deep blue, frosted by feathers of cirrus cloud. Breezes make murmur within the mesh of tree branches above. All else remains quiet but for the birds in song and conversation. I have encountered the blue jay, cardinal, tufted titmouse, downy woodpecker, red-bellied woodpecker, black-capped chickadee, slate-colored junco, red-breasted nuthatch, red-tailed hawk, Cooper’s hawk, song sparrow, house sparrow, and rock dove. 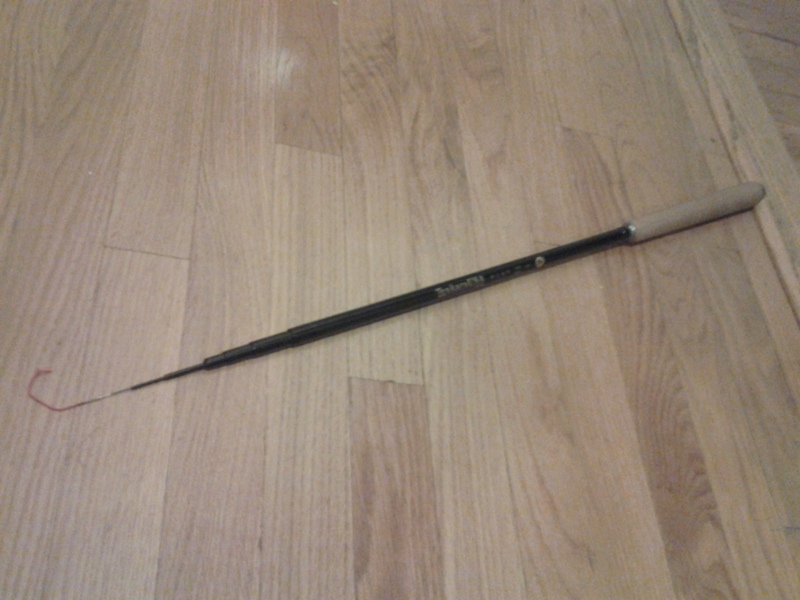 Tenkara this January has become the art of fishing for feathers used in my fly tying. 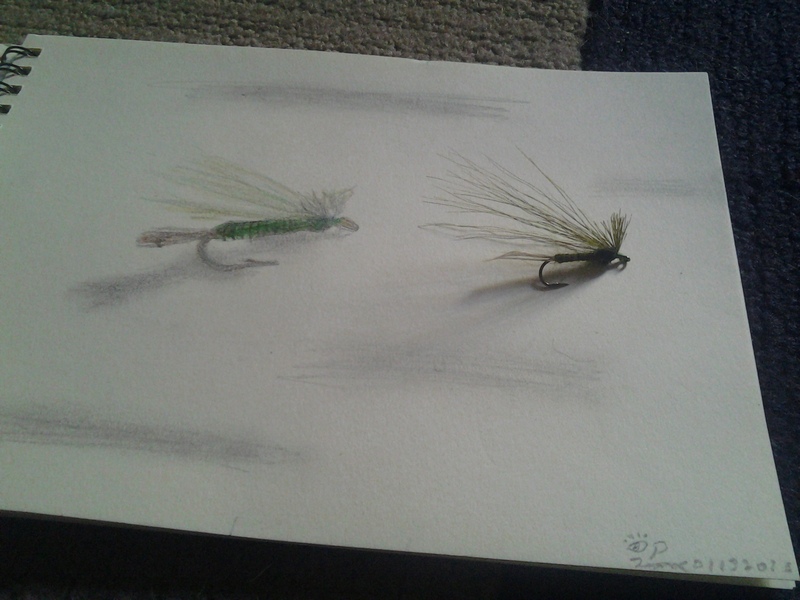 Plumes of pheasant, starling, partridge, and peacock are present beside my vise where I spend time tying a kebari, sketching a hook, writing a book in a natural light heightened by the bright white of fresh snow. April Light . . .
May in Manhattan may start as predicted; beginning with cool rain. The eye finds light labor and mind thinks how to work out images in contrast in two dimensions. This time the one color wrought shades gray: the gray that some years gives May as much abundant green as there is on this day of April light. 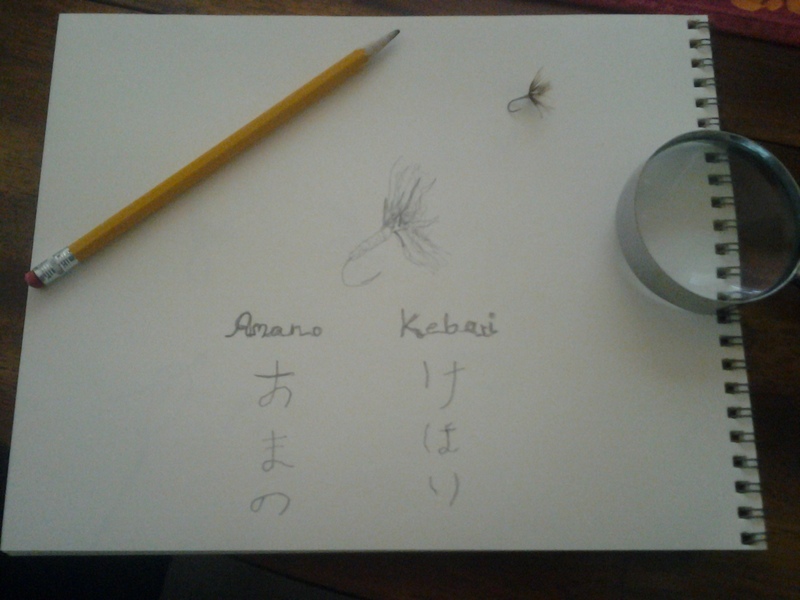 Clear, bright, today refracted sun sets the pencil in motion with an Amano Kebari portrait in repose on paper. Just sketchin’ . 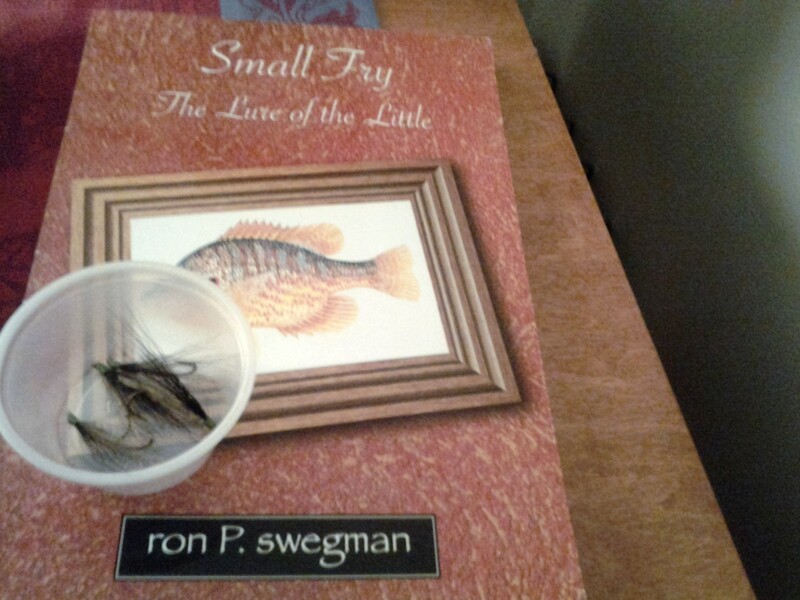 . .
ron P. swegman is an angler, artist, and author whose writing focuses on those times and places when and where nature and the city intersect.